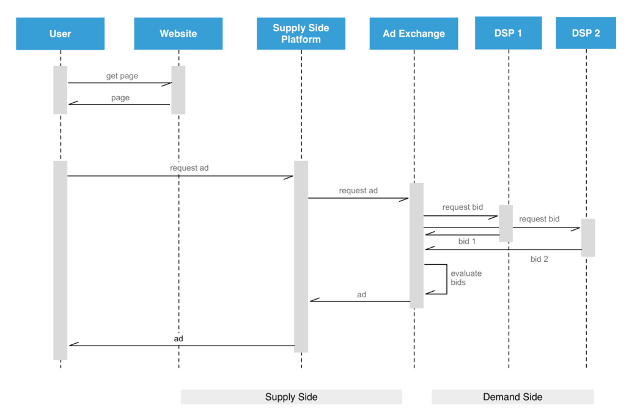 The latest whitepaper to be published by dotMobi takes an in-depth look at some of the technologies and issues involved in implementing real-time ad exchange networks in a multi-device environment. It takes us on a journey through the mobile ad service chain, highlighting where device-diversity and detection can be leveraged to get the most out of ad targeting in a multi-screen world.According to Gartner Research, global mobile advertising spend was $13.1 billion in 2013, and is projected to be $42 billion by 2017, so this is clearly something that’s worth getting right.To get this right, ad exchanges and publishers need to have as much contextual information about a site visitor as possible. A key component is knowing about the device that a user is accessing a site with. And to know everything about a device so that relevant ads are delivered in real-time requires device intelligence. Where device type could be anything from a wearable heads-up display to a mobile phone or TV, and device properties can include things like screen-size, HTML5 support, and OS. The report then goes on to show how device-detection is a key component in Real Time Bidding networks for mobile ad exchanges. Real Time Bidding (RTB) has emerged as a standard to enable an efficient marketplace for ad inventory. RTB has been around for longer on the fixed web but its features really shine in the mobile world where so much more contextual information can be added into the mix. Growth in RTB has been very strong. IDC expect more than 40% of total mobile and online display advertising to be RTB-based in 2017. Details of creative – banner or video, dimensions, formats etc. Of particular interest is the last item above: the site visitor’s device information is part of the information contained in the RTB specification and lists everything known about the user’s device. A user’s complete device information is sent back to advertisers bidding on inventory as part of the bidding process. For an ad exchange to be effective and competitive, it must have a reliable, efficient, and accurate solution to this part of the system, and that’s where device description repositories like DeviceAtlas come in. They are used at different points thoughout the RTB ecosystem to convert the UserAgents of visiting devices into rich device information to help the bidder assess the full value of the impression. For more technical details and insights, get the full whitepaper here or head over to the DeviceAtlas site.